Responsibility for authoring, reviewing, and ownership of content can span across departments, functions, trading partners, and countries, in multiple languages. DCP provides a single, integrated environment for creating, contributing, reviewing, and revising structured content. DITA is an XML standard that has gained widespread acceptance as an information architecture for technical manuals, training, reference materials, and other types of content. DITA helps authors focus on content creation instead of formatting, and provides a standard for content interchange and interoperability between authoring tools, CCMSs, and publishing components. DITA can be specialized to support new types of content, providing a basis for building custom content applications. Dakota implements custom DITA solutions that support customer-specific requirements, such as publishing technical manuals, product specifications, industry standards, marketing collateral, and knowledge bases. 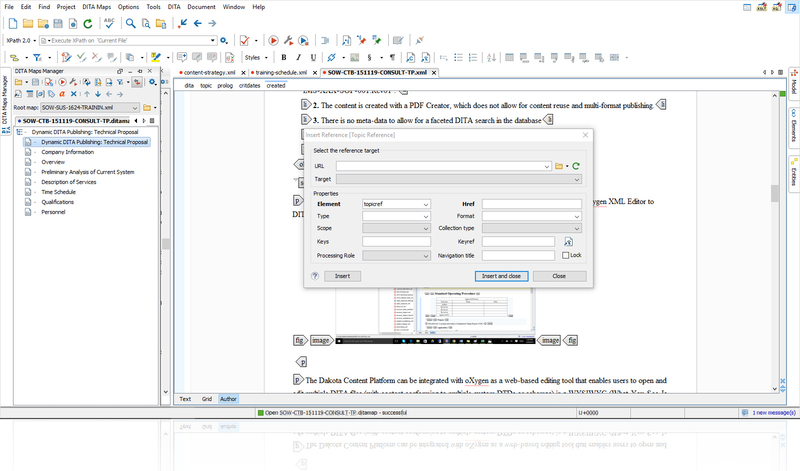 DCP supports DITA authoring and publishing out of the box, providing a scalable platform for content reuse, localization, dynamic content distribution, and single-source publishing. The U.S. Social Security Administration (SSA) developed an internal policy management system, PolicyNet, to assist with the updating and publishing of technical documentation. To create a more efficient workflow, Dakota assisted with the large-scale implementation of the oXygen XML editing component. The project involved a configuration of the editing tool, linking it to a shared document repository and customizing editing features that fit the needs of the SSA. The authoring tool allows non-technical SMEs and publication managers to collaborate on content creation, while still providing the full functionality of a structured authoring system.